According to home insurance provider, Direct Line, the dates when you need to be most vigilant over Christmas are the 5th, 6th, 11th, 17th and 18th December. Statistically these are the dates when most break ins take place over the Christmas period. More insurance claims are made during December than any other month of the year. It’s not difficult to see why. 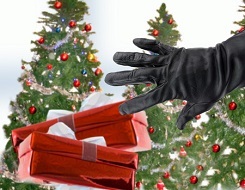 The lure of all those brand new Christmas presents is just too good an opportunity to miss for burglars. They’re particularly looking for bicycles, games consoles, phones, laptops, tablets and cameras – all common gifts. Your home is most vulnerable in the late afternoon/early evening after darkness has fallen but before you’re home from work. Weekend evenings when you’re out at Christmas parties are also popular as they can take their time knowing you’ll likely be out until late. Could you making your home more vulnerable to a Christmas burglary? Without really being aware of it, many of us are unwittingly helping burglars to target our homes. Choosing which home to break into is rarely a random act; they will seek out the homes that appear to offer the most promising yield with the least amount of effort. By offering clues to what you have and failing to take physical security measures you could be shining a spotlight straight on your home. We may have revealed the dates you’re most at risk of being burgled but you should obviously remain as security conscious throughout the Christmas period and into the New Year. Nothing is as likely to ensure a pretty miserable Christmas as a break in. If we can help you with your locks, burglar alarm or safe then please call us on 0800 612 9799 or call into our shop on Roundwood Industrial Estate in Wakefield.